But it’ll take more than that! While the boys are fighting them on the beaches, us girls have a job to do! Air wardens, fire guards, rescue workers; if fair Britannia’s going to make it through this, we’ll all need to do our part! 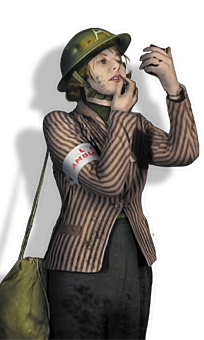 BLACKOUT is a Powered by the Apocalypse roleplaying game about female Civil Defence volunteers during the London Blitz. As air wardens, rescue workers, fire guards, first aid responders, and welfare services, you venture forth from the bomb shelters to confront the horrors being unleashed from above, fighting fires, saving lives, and trying to piece back together your fair city even as the enemy tries to blow it to pieces! Designed for intense one-shot play in any time frame, BLACKOUT is easy to run and quick to set up. Mix and match Identites and Roles to create a unique character, collectively design your London community, and defend it as the bombs fall. Take Charge of civilians and other responders, Make Time for those in need, Size Up bomb sites, and Press On into danger! This 80 page book contains the rules of play, background information on both the city and the war, a GM section containing further background, and a number of alternate play settings and time periods, with optional rules and guidelines. The game has five roles and five identities that can be combined together to create characters, and is fully illustrated with stylized, colourized period photography. You need the game's printable Playbooks (they're free!) to play! I see it says there is a 1 player variant in the contents. Does that mean it plays solo? It means 1 player and a GM. This title was added to our catalog on July 28, 2017.